Here is a Georgia State Trooper in riot gear at a KKK protest in a north Georgia city back in the 80s. The Trooper is black. 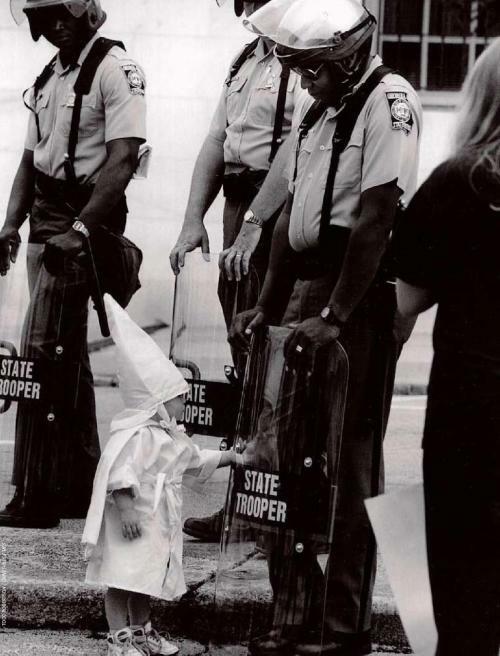 Standing in front of him and touching his shield is a curious little boy dressed in a Klan hood and robe. I have stared at this picture and wondered what must have been going through that Trooper’s mind. Before the Trooper is an innocent child who is being taught to hate him because of the color of his skin. The child doesn’t understand what he is being taught, and at this point he doesn’t seem to care. Like any other child his curiosity takes hold and he wants to explore this new thing that this man is holding probably because he can see his reflection in it and that’s a neat thing and he wants to check it out. In this picture I see innocence mixed with hate, the irony of a black man protecting the right of white people to assemble in protest against him, temperance in the face of ignorance, and hope that racism can be broken because this young boy may remember that a black man smiled at him once and he didn’t seem so bad after all.